During the worst periods of the civil war in Guatemala in the 1970s and early 1980s, thousands of people fled from rural Indigenous communities to the southern Mexican states of Chiapas, Campeche and Quintana Roo, and lived there in refugee camps. For over a decade these camps became home and received the support of the international community including PWRDF. Many of the women living there took advantage of community development, literacy, health and leadership training programs and also organized themselves. 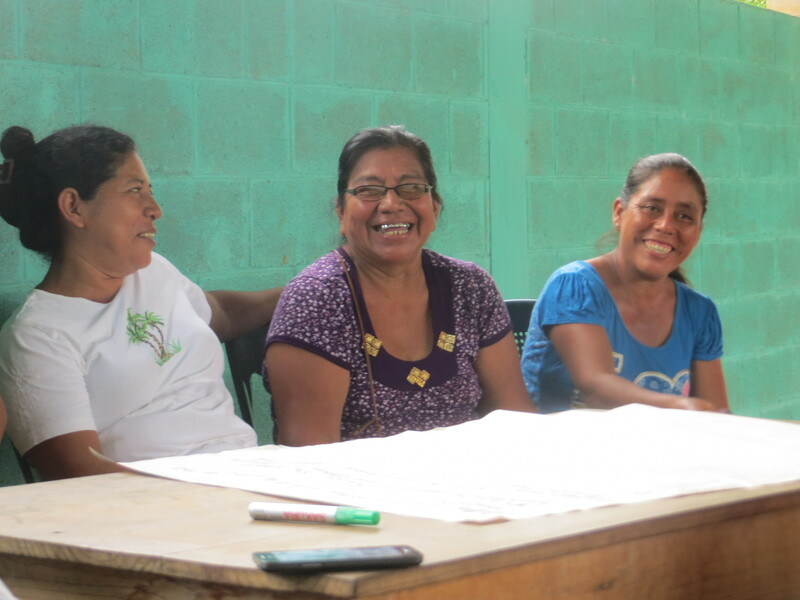 In the ‘90s, women and their families returning to the St. Domingo Suchitepequez in the southeast re-established MADRE TIERRA, the women grassroots organization born in exile. The southwestern pacific coast is one of the richest Guatemalan agricultural areas. Sugar cane, African palm, and banana and pineapple plantations -in the hands of very few landowners, proliferate. However within these, poverty is alive together with a food security crisis. Most men work in the farms, women and children too but their work is not paid as equal, as they are seen as helpers only. Agro-industry, the lack of resources, particularly of land, makes it almost impossible, in particular for women, to produce food. At national level, only 6% of women who produce food are owners or co-owners of land. MT has approximately 342 members from 7 rural communities with the mission to “promote changes in the situation and position of rural, uprooted women, with a gender and intercultural focus, at local, municipal, regional and national levels.” A women’s coordinating committee oversees the work in the areas of social participation and non-violence, women’s health, economic productivity and sustainability, and education. Women younger than 35 years of age make up 40% of members of each area committee. MT advances its community and leadership program despite the isolation, the scarcity of resources, the workload -as women are in charge of domestic, farm as well as volunteer community work, and the fact of leaving in a “Risk Zone”, vulnerable to both rainy and dry seasons. In 2018, year 3 of the PWRDF-approved project, focused on capacity building. MT plans to continue developing strategies and tools for consultation and for identifying organizational gaps and assets, establishing and inventory of organizational resources, conducting a base line, documenting achievements, developing a presence in social media and improving on PM&E.